It was voted in 2000 by VH1 as the #3 song on its list of “Greatest Rock Songs” and landed the #31 spot on Rolling Stone magazine’s “Greatest Songs of All-Time” list. 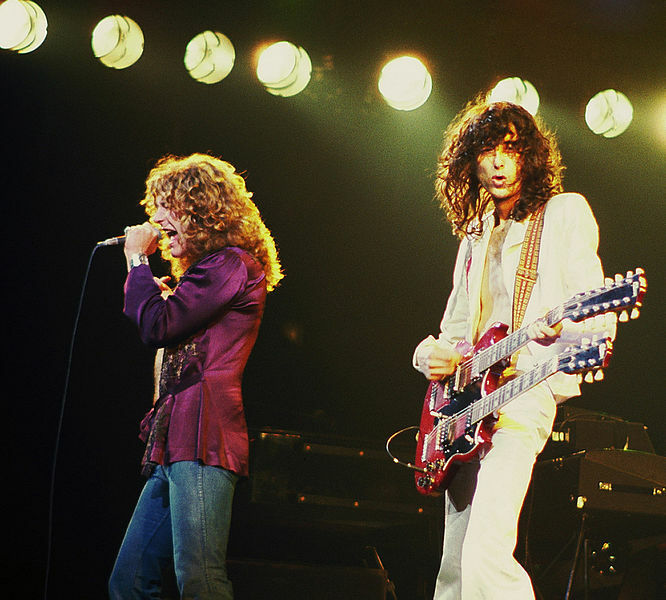 Written by Robert Plant (lyrics) and guitarist Jimmy Page (melody) Stairway to Heaven is not only Led Zeppelin’s signature song, it may well be the most beloved rock song of all-time. If not, it is generally on almost every rock critic’s, expert’s, and fan’s list of greatest and/or favorite songs. Recorded from December 1970 to March of 1971, the album and song were released on November 8, 1971 on the untitled fourth Led Zeppelin album (usually referred to as “Led Zeppelin IV”). As to the song’s haunting music and beautiful guitar solos, Jimmy Page elaborates, “I had these pieces, these guitar pieces, that I wanted to put together.” Page always carried a tape recorder around with him and says he composed the song “over a long period”. Led Zeppelin first played the song in public on March 5, 1971, at Belfast’s Ulster Hall. At the song’s original public rendition, the reception wasn’t very encouraging. Led Zeppelin’ bass player John Paul Jones recalls the fans at this concert “were all bored to tears waiting to hear something they knew”. It has even been reported that the song was actually booed by a few fans at this first public performance of it. I’d break out into hives if I had to sing Stairway to Heaven in every show. I wrote the lyrics and found the song to be of some importance and consequence in 1971. But 17 years later, I don’t know. It’s just not for me. I sang it at the Atlantic Records show because I’m an old softie and it was my way of saying thank you to Atlantic because I’ve been with them for 20 years, but no more of Stairway to Heaven for me. Plant even once went so far as to make a monetary pledge to a public radio station if they promised they would never play Stairway to Heaven again. His annoyance was no doubt buoyed by the fact that by 1991, on the 20th anniversary of the release of the song, it was announced that radio stations had played Stairway to Heaven an estimated 2,874,000 times. If this playing time was back-to-back, it would amount to about 44 years. I knew it was good, but I didn’t know it was going to be almost like an anthem. The wonderful thing about Stairway to Heaven is the fact that everyone has their own individual interpretation to it, and actually what it means to them at their point if life. Sometimes this meaning can be powerful- Plant cited the most unusual performance of his signature song when it was performed live “with two drummers while Duran Duran cried at the side of the stage- there was something quite surreal about that”. To be fair to Plant, I guess it could get annoying to hear ceaseless talk and adoration of one of your own songs, particularly as he is undeniably one of the greatest singers and composers in rock music history and had a slew of amazing songs that are much less talked about. Kind of like Tina Louise hating her “Ginger” role on “Gilligan’s Island” or Fred Gwynne refusing to talk about playing “Herman Munster” or Elvis looking down on his early days as a hip-swiveling rebel belting out “Hound Dog”. I imagine if Leonardo Da Vinci was alive today, he would be sick and tired of everyone’s incessant chatter about the Mona Lisa. The artists themselves have a perfect right to their own opinions and views regarding their own works- but so do we, their fans. And Stairway to Heaven never fails to send a chill up my spine whenever I hear those incredibly haunting first guitar notes of Jimmy Page come on over the radio or when I listen to Robert Plant’s unbelievably brilliant voice speaking out the song’s vague but unforgettable lyrics. The greatest rock song ever? Many would argue with me, but for my dime, yes it is. Stairway To Heaven is a rip-off of a song by Spirit. Yea right, you must be a Stones Fan. I do not want to anger anyone because Robert Plant is great. However, if he wrote Stairway to Heaven and first recorded it in 71 then how did The Doors perform it at the bowl in 1968. You can see this for yourself on you tube. I am not really sure who really wrote it. Led Zeppelin made the song legendary but they were not the first to sing it. It is a Zep song and they were the first to do it. The “Doors” version is video of the real Doors with an audio overlay of a Doors cover band doing the Zep version. If you can use the internet to see this stuff and make a comment, then why not use the internet to scope out a few actual facts? Too lazy? Youtube comments say it is a well made video but faked. I do love Zepp but not this song.Not their worst song but definitely not their best.And it’s not the best song of all time,too. The best Song ever and not even close. The song was torus, by spirit,which was LEDs favourite band, the intro of their song was already in Robert plant’s head, he just had to add an assenting high note to the riff that spirit had already written, when you listen to it you”ll hear it. It had its time with me… now after so many years, I am dead sick of hearing this on the radio to the point I either turn it off or change stations… same with Pink Floyd DSOTMoon, and many “classics” – we get tired and move on… heck, why am I bothering ? Give me Immigrant Song anytime please. By far the greatest song ever written, but many just don’t have the depth to get the spiritual beauty of it and that’s sad. One of if not the greatest lead guitar riff ever and drums that are so perfect it was heaven its self played them. The only song that for an entire decade was the most requested song. Ripoff, yea right, the Lyrics the lead, the drums, nothing is the same but maybe a few notes are similar at the start of the classic.